Some may remember the deadly book of Aristotle that plays a vital part in the plot of Umberto Eco’s 1980 novel The Name of the Rose. Poisoned by a mad Benedictine monk, the book wreaks havoc in a 14th-century Italian monastery, killing all readers who happen to lick their fingers when turning the toxic pages. Could something like this happen in reality? Poisoning by books? Our recent research indicates so. We found that three rare books on various historical topics in the University of Southern Denmark’s library collection contain large concentrations of arsenic on their covers. The books come from the 16th and 17th centuries. The poisonous qualities of these books were detected by conducting a series of X-ray fluorescence analyses (micro-XRF). This technology displays the chemical spectrum of a material by analysing the characteristic “secondary” radiation that is emitted from the material during a high-energy X-ray bombardment. Micro-XRF technology is widely used within the fields of archaeology and art, when investigating the chemical elements of pottery and paintings, for example. The reason why we took these three rare books to the X-ray lab was because the library had previously discovered that medieval manuscript fragments, such as copies of Roman law and canonical law, were used to make their covers. It is well documented that European bookbinders in the 16th and 17th centuries used to recycle older parchments. We tried to identify the Latin texts used, or at least read some of their content. But then we found that the Latin texts in the covers of the three volumes were hard to read because of an extensive layer of green paint which obscures the old handwritten letters. So we took them to the lab. The idea was to filter through the layer of paint using micro-XRF and focus on the chemical elements of the ink below, for example on iron and calcium, in the hope of making the letters more readable for the university’s researchers. But XRF-analysis revealed that the green pigment layer was arsenic. This chemical element is among the most toxic substances in the world and exposure may lead to various symptoms of poisoning, the development of cancer and even death. Arsenic (As) is a ubiquitous naturally occurring metalloid. In nature, arsenic is typically combined with other elements such as carbon and hydrogen. This is known as organic arsenic. Inorganic arsenic, which may occur in a pure metallic form as well as in compounds, is the more harmful variant. 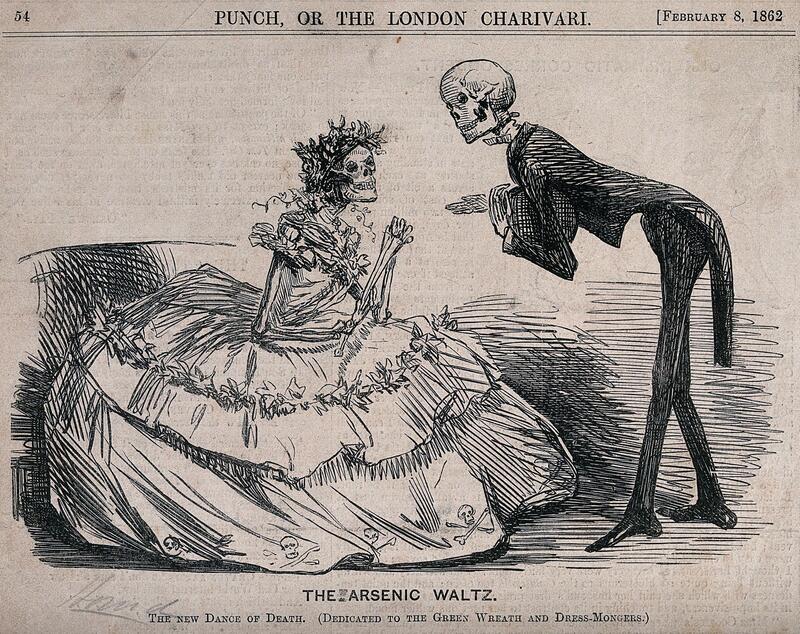 The toxicity of arsenic does not diminish with time. Depending on the type and duration of exposure, various symptoms of arsenic poisoning include an irritated stomach, irritated intestines, nausea, diarrhoea, skin changes and irritation of the lungs. The green arsenic-containing pigment found on the book covers is thought to be Paris green, copper(II) acetate triarsenite or copper(II) acetoarsenite Cu(C₂H₃O₂)₂·3Cu(AsO₂)₂. This is also known as “emerald green”, because of its eye-catching green shades, similar to those of the popular gemstone. The arsenic pigment – a crystalline powder – is easy to manufacture and has been commonly used for multiple purposes, especially in the 19th century. The size of the powder grains influence on the colour toning, as seen in oil paints and lacquers. Larger grains produce a distinct darker green – smaller grains a lighter green. The pigment is especially known for its colour intensity and resistance to fading. Industrial production of Paris green was initiated in Europe in the early 19th century. Impressionist and post-impressionist painters used different versions of the pigment to create their vivid masterpieces. This means that many museum pieces today contain the poison. In its heyday, all types of materials, even book covers and clothes, could be coated in Paris green for aesthetic reasons. Of course, continuous skin contact with the substance would lead to symptoms of exposure. But by the second half of the 19th century, the toxic effects of the substance were more commonly known, and the arsenic variant stopped being used as a pigment and was more frequently used as a pesticide on farmlands. Other pigments were found to replace Paris green in paintings and the textile industry etc. In the mid 20th century, the use on farmlands was phased out as well. In the case of our books, the pigment wasn’t used for aesthetic purposes, making up a lower level of the cover. A plausible explanation for the application – possibly in the 19th century – of Paris green on old books could be to protect them against insects and vermin. Under certain circumstances, arsenic compounds, such as arsenates and arsenites, may be transformed by microorganisms into arsine (AsH₃) – a highly poisonous gas with a distinct smell of garlic. Grim stories of green Victorian wallpapers taking the lives of children in their bedrooms are known to be factual. Now, the library stores our three poisonous volumes in separate cardboard boxes with safety labels in a ventilated cabinet. We also plan on digitising them to minimise physical handling. One wouldn’t expect a book to contain a poisonous substance. But it might.